Since the dawn of YouTube we’ve been sharing the hours of video you upload every minute. 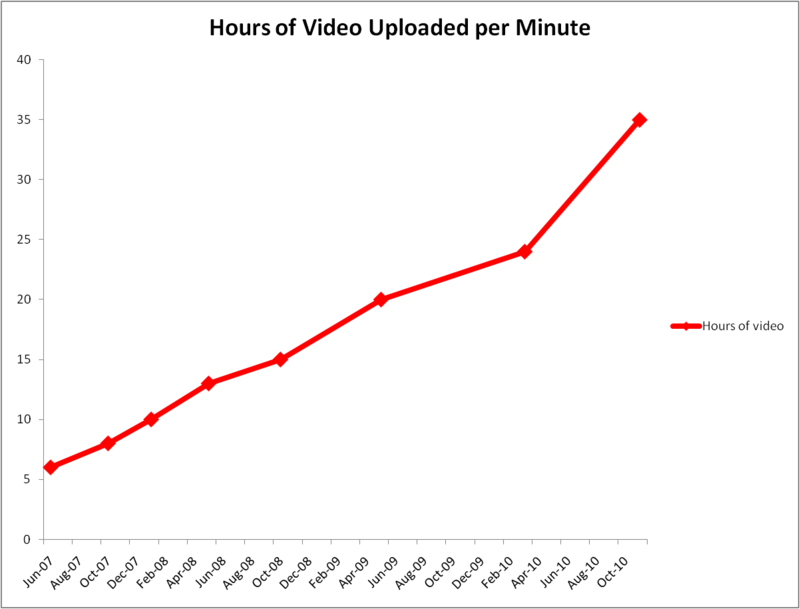 In 2007 we started at six hours, then in 2010 we were at 24 hours, then 35, then 48, and now...60 hours of video every minute, an increase of more than 30 percent in the last eight months. In other words, you’re uploading one hour of video to YouTube every second. Tick, tock, tick, tock — that’s 4 hours right there! For all the hours of video you’re uploading—you’re watching more as well; we’ve now exceeded four billion video views globally every day. That’s up 25 percent in the last eight months and the equivalent of more than half the world’s population watching a video every day, the same number as there are US $1 bills in circulation, the same as number of years since there was water on Mars...it’s a big number, and you’re making it bigger every day. With more original Channels rolling out this year, a new homepage to help you find and follow Channels you love, and new tools for creators always on the horizon, we’re excited to see how many times you’ll grow these numbers this year! I am Very thank full the owner of this blog. Because of this blog is very informative for me.. And I ask u some thing You make more this type blog where we can get more knowledge. Thanks you very high work..
4 billions its a lot and if you want to promote your video and get real YouTube views you should check this web site.